Members of the Gallia Academy wrestling team pose with the first-place trophy following their victory on Saturday in Proctorville, Ohio. PROCTORVILLE, Ohio — Starting off strong. 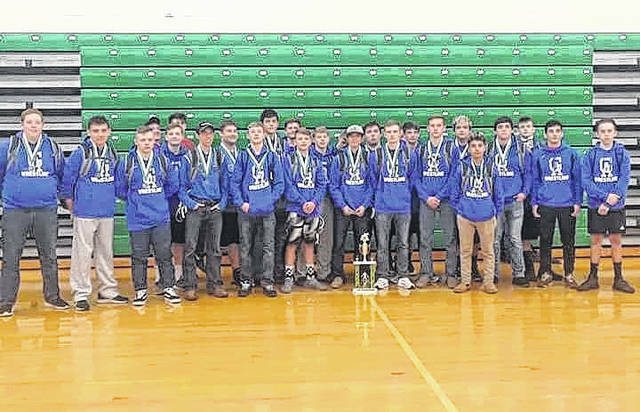 In the opening meet of the season, the Gallia Academy wrestling team claimed first out of an 11-team field on Saturday at Fairland. The Blue Devils posted a team total of 303.5, bettering second place Ashland Blazer by 90.5 points. Huntington Ross was third with a 148, followed the host Dragons, who had a 119. Four points back of FHS, in fifth place, Eastern had a 115. Belpre was sixth at 109.5, followed by the Wildcats from Logan at 77. Federal Hocking placed eighth with a 74, South Gallia was ninth at 54.5, while Chesapeake was 10th with a score of 44. South Point rounded out the 11-team field with 12 points. Gallia Academy won the lightest three weight classes, with Caleb Greenlee going 4-0 at 106 pounds, Jason Stroud going 5-0 at 113, and Kyle Greenlee going 3-0 at 120. Also at 113 for the Blue Devils was third place finisher Kenton Ramsey, who was 3-2. Five Blue Devils earned runner-up finishes, each of whom went 4-1. The second place wrestlers for GAHS were Justin Day in the 132-pound weight class, Kaden Ehman at 160 pounds, Kenny Siders in the 170 category, Logan Griffith at 220, and Hunter Terry in the heavyweight class. Also at 285 pounds, Jonathan Shepherd was third with a 3-2 mark. In addition to Ramsey at 113 and Sheppard at heavyweight, Grant Bryan, Bronson Carter, Boo Pullins and Andrew Mullins each finished third. Carter went 4-2 at 145 pounds, while Bryant, Pullins and Mullins were each 3-2 at 126, 182 and 195 pounds respectively. Tristin Crisenbery, the Blue Devils’ only fourth place finisher, was 1-3 at 138 pounds. The Eagles had a trio of runner-up wrestlers and one third place grappler. Gavin Erwin and Steven Fitzgerald claimed second place in the 182 and 195 classes respectively, each going 4-1. Dillon Aeiker earned his second place spot in the 138 class, going 3-1, while Sam Jones took third in the 220 category with a 3-2 record. The Rebels had a pair of third place finishers in the meet, with Justin Butler going 4-1 in the 152 class and Jacob Birtcher finishing 3-2 at 138. The Blue Devils, Eagles and Rebels all return to action on Saturday at Chesapeake.